Cake flavours can be arranged to suit your needs, even using a different flavour in each tier, for example, a 3 tier cake can consist of chocolate mud on the bottom, white mud in the middle, and top tier could be caramel mud. Greg also makes the very best Cup Cakes in a choice of flavours and supplies the stand with a cake on top included for cutting and photo purposes. You can have 1 to 1000 cupcakes. The cakes, fillings and icings listed below give you an idea of what your cake will taste like. If there is a particular cake or icing that you would like but are not sure what to complement it with, I can help you put together the perfect cake for your needs. If there is something that you would like, which is not mentioned here I am happy to incorporate that into your design. Dark Chocolate Mud � Dense, decadent, stick to your teeth - like brownie, mud cake. Moist and absolutely sinful! Chocolate Mud � Less dense and more cake like. Still moist and delicious. Caramel Mud - Sweet and moist. White Chocolate Mud - Sublime and laced with white rum. Marble Mud - White and dark chocolate mud cake. Choc Jaffa Marble cake - Orange and dark chocolate mud cake. Jamacian Coconut Bounty Mud - Dark chocolate mud cake with coconut swirl. Rich Dark Fruit Cake. Wonderfully rich and moist dark fruit cake. Made with quality dried fruit soaked in brandy and honey. Light Fruit Cake. Lighter style fruit cake, lighter in colour with less fruit yet still delicious. Fondant � Also called �White Icing�, �plastic icing� or �Wedding Cake Icing�� Traditionally used to cover fruitcake but can be used to cover other cakes also. 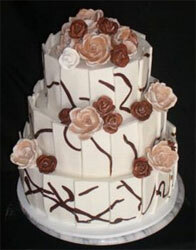 Fondant has a smooth, porcelain finish and provides a firm base for decoration. Cakes iced in fondant may have a layer of butter cream, ganache or apricot glace underneath.